OAKWOOD IS NOW OPEN TO REGIONAL CONTRIBUTORS. SDSU students, alumni, and residents of neighboring states are welcome to submit literary works (fiction, poetry, non-fiction, plays) as well as color or black-and-white art. Our submission period is typically January of each year and guidelines are available on our submissions page. Keep up to date with our submission and release cycle by following our Facebook page. We’ve extended the submissions deadline for our 2016 issue until Sunday, February 6. See our Submissions Guidelines page for full information. It’s time to gear up for another issue of Oakwood, SDSU’s long-running literature and arts annual. Submissions will open on January 11 and close January 31, so polish of your very best work before then and send it to sdsu.oakwood@sdstate.edu. Happy writing until then! 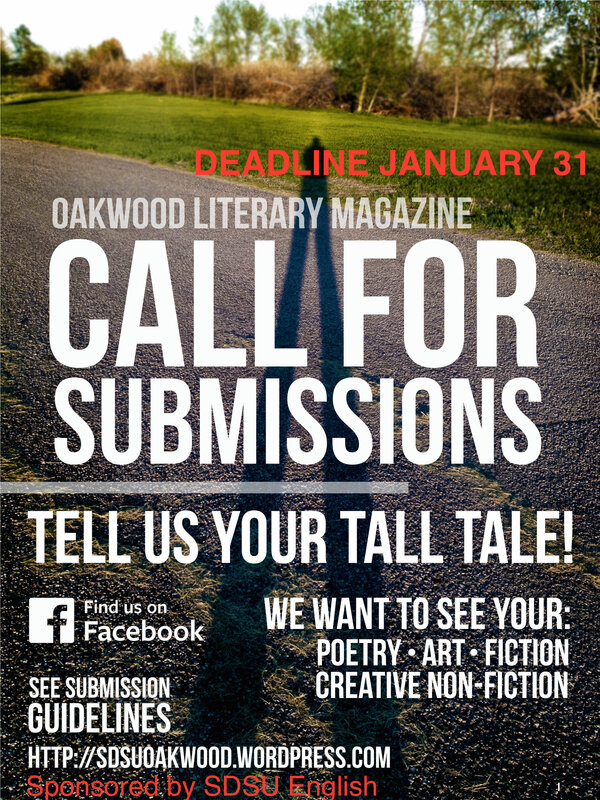 The Oakwood team is now accepting submissions for the Oakwood 2015 Literary and Art Magazine. Tell us your tall tale by submitting your poetry, art, fiction, and creative non-fiction! Deadline for entries is February 7th. See the submission guidelines for more information. Here is another opportunity to improve your craft. The Minnesota Northwoods Writers Conference is offering scholarships for the summer conference and workshop. The workshop is a week long event where you have an opportunity to work with members of the writing field and experience a number of fun activities. Here is the website and scholarship information for this great opportunity. Iron Gall Press is currently looking for submissions from striving writers. They publish fiction, poetry, non-fiction, artwork and photography and even flash! They are looking for works that might fascinate or excite them. They are open to anything that is well-written or transcends the genre of the specific piece. If you find interest in this possible publishing opportunity, you can visit their website at http://www.irongallpress.com.